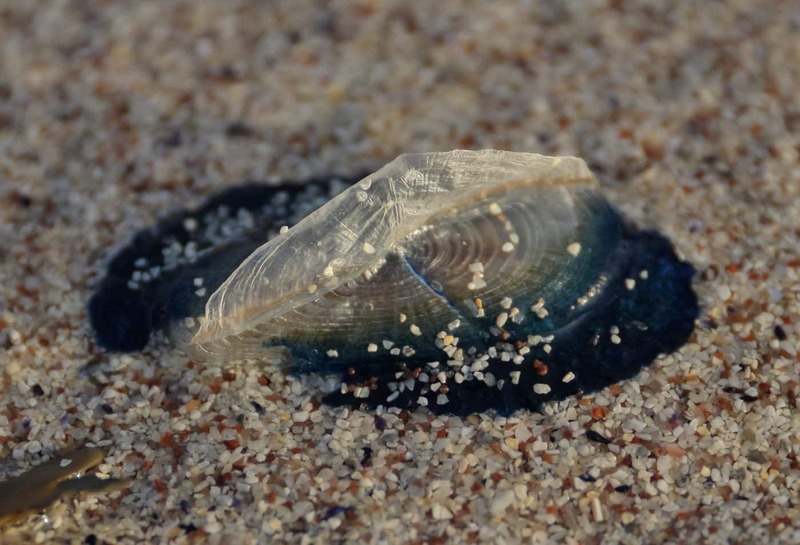 The by-the-wind-sailor Velella velella is an oceanic animal that is occasionally wrecked in large numbers on the west coast of the British Isles, from Cornwall to the Outer Hebrides. Just such a wreck occurred over the New Year period, most likely as a result of Atlantic storms on 24th and 26th December 2016 and again on 3rd January 2017. 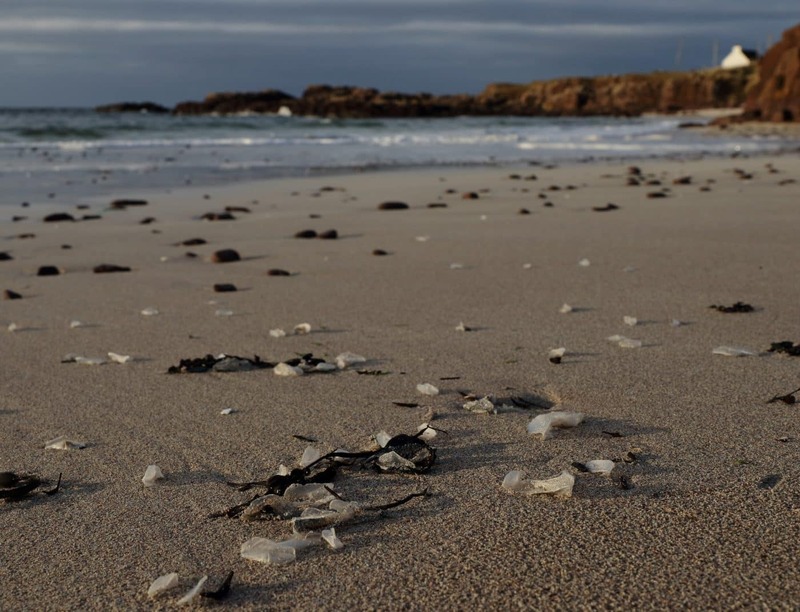 On 29th December 2016, we read on Facebook that hundreds of thousands had been washed up on the beaches of islands off the west coast of Scotland, and on 5th January 2017 another Facebook post recorded thousands on the beaches of Orkney. Having never seen these animals before we headed, on 5th January, for the beach at Clachtoll in Assynt (NC0427), where we too found thousands and photographed a selection. 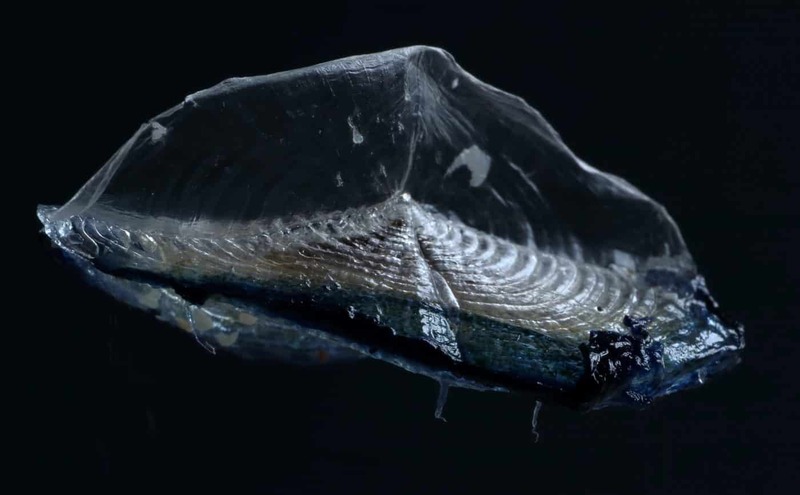 Some still had traces of the deep blue living tissues, others retained just the chitinous skeleton with its chambered float and characteristic sail. The majority had left-handed sails, with just a few right-handed ones. The skeletons were still visible on the following day, but the day after that they had become difficult to find. The by-the-wind-sailor is not a jellyfish, but belongs to the same phylum (Cnidaria) as them, soft corals, sea fans and sea anemones. It is placed in the class Hydrozoa, together with a large variety of usually small, sessile organisms, and one other, much larger, oceanic relative, the Portuguese man-of-war. It has stinging tentacles, which are used to catch small planktonic animal life. 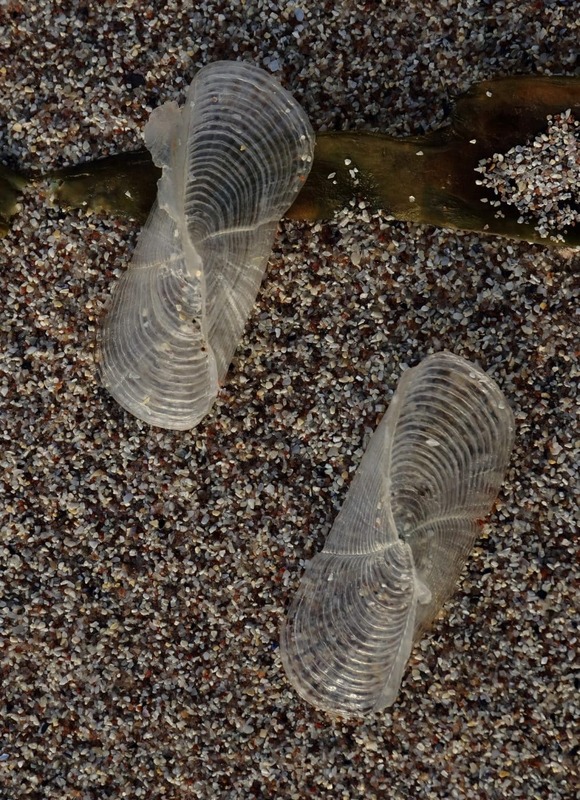 It can grow to 6cm in length, but those at Clachtoll were typically 2.5- 4cm. Ian Evans tells us that the last wreck in the north-west known to him was back in August and September 1998, when they were noted from Rieff in West Ross north to Sandwood Bay (HBRG Newsletter 12, 32, 1999). It is said that ‘vast swarms travel in the N. Atlantic gyre’ and the two forms ‘tend to be sorted into separate groups by winds’ (Hayward et al., 1996), occasionally being blown ashore. Wrecks usually occurred in the past following prolonged autumn gales, but the weather patterns causing them may have changed in recent years. Having been made aware of the most recent wreck through social media we thought it right to reciprocate. We posted on the Facebook page of Assynt Field Club on 5th January and this post, which included several photographs, was seen by just short of 7500 people within 3 days. Hayward, P., Nelson-Smith and Shields, C. 1996. Collins Pocket Guide. Sea Shore of Britain and Northern Europe. London:Harper-Collins.